Taking the whole family for a day on the slopes can be daunting. When your drive time outweighs the downhill time – you need to rethink your ski plans. Ski and stay packages can be just the fix for families. For not much more than a day’s lift ticket, you can get more for your buck when you can ski all day and spend the night, hit the pool and relax versus hitting the road at 4pm. New England ski resorts are offering a bonanza of specials and deals including free skiing for kids, or kid stay free with parents. Particularly if you can travel midweek non-holiday, you will have the cat by the tail (as my mom would say). Look for rates that include extras like kids’ ski camp, or lodging specials that let kids stay free with paying parents. 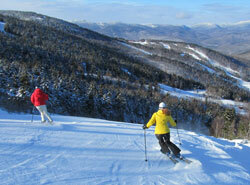 In Vermont, ski un-crowded, and beautiful but easy to get to Burke Mountain. Stay in the top shelf new Burke Mountain Lodge in a studio suite for $223 a night including lift tickets for two. 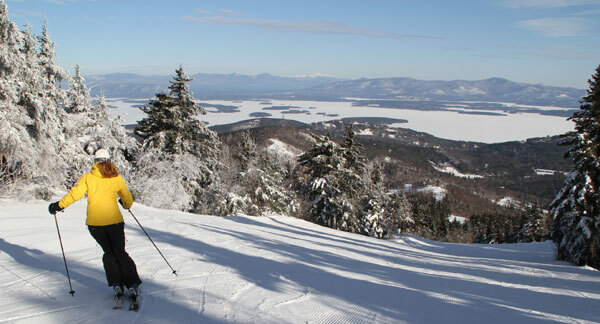 The skiing is classic on this 2,011′ vertical mountain with two high speed quads, and the new on mountain Burke Mountain Hotel is on par with Sugarbush’s Clay Brook Inn, The Mountain Club at Loon, and the Grand Summits of Sunday River, Sugarloaf, Attitash, Killington and Mount Snow. Okemo offers some pretty attractive ski & stay deals, kids 12 and under always stay free with their parents, 6 and under ski free, and if you visit by Dec. 20, kids get free learn to ski or snowboard lessons. Okemo Mountain’s deluxe slopeside condominiums or the Jackson Gore Inn are super convenient ski in ski out locations with heated pool privileges. At Stratton, kids 17 and younger ski and stay free when two parents purchase a lift and lodging package in a Stratton condominium, packages start at $95 per person each night with a two night minimum. Maine’s Sugarloaf and Sunday River offer great ski and stay deals for family ski holiday in January during Children’s Festival Week. Book a ski and stay package, spend quality time with your little kids who can afford to skip a little school, stay three midweek nights and receive free lift tickets, rentals and lessons for children ages 4 -12. This week, at either The River or The Loaf, is geared toward families including evening entertainment and game nights. 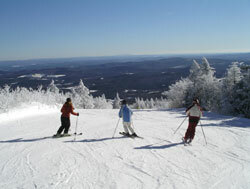 Sugarloaf also offers several Kids & Teens Ski Free Weeks. Families who stay for three midweek nights receive free lift tickets for children who are 18 and under. Ski and stay packages start at just $79 per person, per night. New Hampshire’s White Mountain ski resorts are convenient, affordable, and fun with the variety of four ski resorts within 20 minutes of each other, Cranmore, Attitash, Wildcat and Black Mountain. You can stay slopeside at Cranmore or Attitash. Or step back in time at the grand old Eagle Mountain House in Jackson, kids stay free in your room, its pet friendly too. This historic happy hotel high on the hill above the beautiful town of Jackson has a fireplace lobby, a Game Room, Library, outdoor sledding and Nordic skiing and a good old fashioned feel for less than other grand Granite state landmark hotels. King Pine Resort in New Hampshire has a steal of a deal. This fifth generation family owned resort, located on pretty Purity Lake in East Madison, is a small scale winter wonderland for young families. It’s just $99 a night for adults and $35 for kids during non-holiday midweek including lodging, family style breakfast and dinner at the Inn, plus skiing at King Pine, or snowshoeing or cross-country skiing on 22km of trails. Plus you have use of the resort’s ice skating, indoor pool and fitness center, night skiing and tubing on weekends and holidays. Horse-drawn sleigh rides are also included on non-holiday midweek stays. Mind you, King Pine is just 350-vertical feet of skiing on 17 short trails – so this is great for families just getting started in skiing. They have ski instruction and a cozy base lodge, and the lodging is homey and rustic, like the pricing. Waterville Valley posts “last minute deals” throughout the winter, like their early December Holiday Tree & Ski package ($87 pp) that includes 2-nights lodging, 1-day lift ticket and “cut your own Christmas Tree.” Sign up for Waterville Valley’s enews to get the best bargains in your inbox. Just keep in mind that these introductory rates are typically for a family of four lodged in a one room studio, with upgrade charges if you want to expand to a more spacious condo with separate bedrooms. But these lodging and lift packages can be worthwhile versus doling out for day tickets. By spending a night or two, you get to enjoy all the resort amenities, and sleep by the slopes, without feeling the rush of having to hit the road after a full day of skiing.